Hi, gang! Time for another hack using Metasploit. We have exploited Windows XP (a very insecure operating system) and we have exploited Ubuntu and installed Meterpreter on a Linux system exploiting the Samba service. Several of you have asked for a hack on more modern Windows systems, so here goes. In this module, we hack into Windows Vista or Windows Server 2008 using a vulnerability found in SMB2. As you know, SMB2 is an application level protocol used to share files, folders and printers on Windows systems. SMB2 is the revised version of Microsoft's SMB that was introduced in 2006 and is used in Windows Vista and Windows Server 2008 (SMB and SMB2 have been plagued with security vulnerabilities from the very beginning). So… let's get started. Boot up your Linux operating system, open a terminal, and load the Metasploit Framework. Before we begin to exploit, we need to scan the network to find the SMB identifiers for the systems we want to hack. 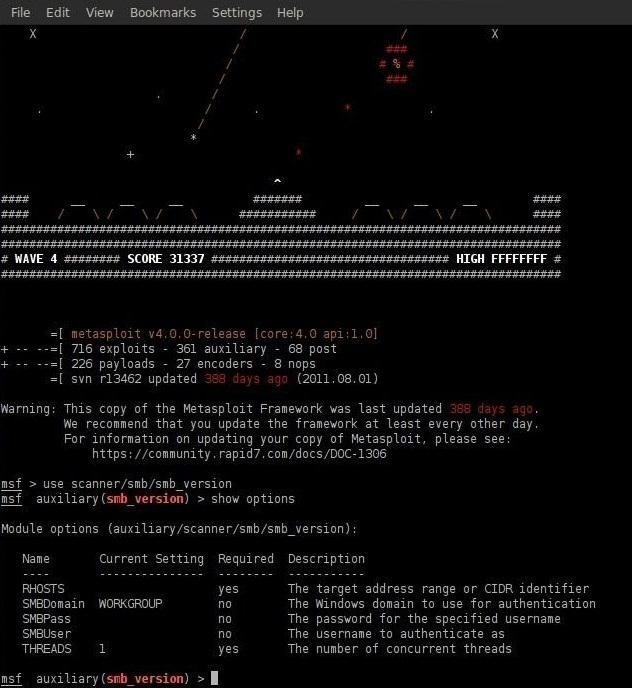 Metasploit has multiple auxiliary modules that can help us with many of the preliminary tasks of hacking, such as scanning our victim network to obtain necessary information. In this case, we will use the auxiliary module scanner/smb/smb_version to scan the network. Next, we need to see our options. Notice from the screen capture that Metasploit displays our options for this auxiliary module. Note here that we need to set our RHOSTS and THREADS. We set our RHOSTS to our targeted address range, in this case 192.168.1.0 through 192.168.1.255 (yours may be different depending upon your network). We then set the number of concurrent threads to 50. By typing show options again, we can see that Metasploit has set our options as we have defined them. If we have done everything correctly, Metasploit will show that we have set our options properly. Next, we need to run our SMB scan on the network. We can see that this scan returns results on all the machines on the defined network giving us critical information on the operating system version, the service pack, and the computer name. In my screenshot example, I have just one computer on the network and the scan correctly identifies the operating system, the service pack, and the computer name. Now that we know there are systems available that are using SMB, we can load the appropriate module in Metasploit, in this case ms09_050_smb2_negotiate_func_index. To learn more about this exploit module, we can simply type info. As you can see in the screenshot above, Metasploit provides us critical background information on this exploit. Now we set our payload to the Windows. We need to check to make certain our options are set properly by typing show options. Finally, we exploit SMB2 on the Vista system. The Vista system then returns a Meterpreter prompt and we type sysinfo. We then type shell to get a shell on our victim system. You have now successfully hacked the Windows Vista box. If this hack doesn't work the first time, try again. Hacking is often a matter of probabilities and all hacks don't work all the time. Look for future how-to articles on using the Meterpreter to control the owned box, using it to pivot attacks from, and cover your tracks. Under step 3 you set the target address range from 192.168.1.0 to 192.168.1.255. Shouldn't it be 192.168.1.1 to 192.168.1.254 because .0 and .255 are invalid? Yes, technically you are correct, but either will work. The idea is simply to cover the full range of hosts on that network. just before "the vista system then returns.." wich comand do you use to make vista return "meterpreter >sysinfo"? The article says type "sysinfo". That's what you should do and it then returns the sysinfo. What is missing? Does it work for Win7 too ? Unix/Linux service, so this only works in those environments. Exploits are very specific to operating system, services, ports, applications and even language. Hi. I just started using Kali Linux and started to follow your tutorial as they have good information as well unlike most that does not describe much. It's a very nice tutorial but unfortunately I am facing a problem in Step 4: Scanning for SMB2. I did do the setup as you mentioned but when I type "run" and press enter I get an error "Auxiliary failed: Msf:: OptionValidateError The following options failed to validate: SMBDirect"
Tried to google search the problem but unfortunately did not get what I was looking for. Any help will be much appreciated. Thank you. Thank you so much Dill. It worked but the funny thing is I did not mess with SMBDirect at all. I just followed the instructions. But it got solved by "set SMBDirect true". Since this is 2009 vulnerability, it is likely that the system is patched. Yes, MANY other exploits. Just search with the platform parameter. Can i use this attack on win7? ?